Manchester United have joined the race to sign 21-year-old right-back Aaron Wan-Bisakka next summer, according to reports. The Croydon-born youngster, who made his Palace debut in February, has cemented himself as a starter this season with a series of impressive performances at right-back under Roy Hodgson. Man United will need to rejuvenate the right-back position over the next year as Antonio Valencia and Ashley Young, both 33, approach the end of their careers. And according to the Mirror‘s Adrian Kajumba, United have joined Chelsea and Manchester City in the pursuit of Wan-Bissaka ahead of next summer’s transfer window. 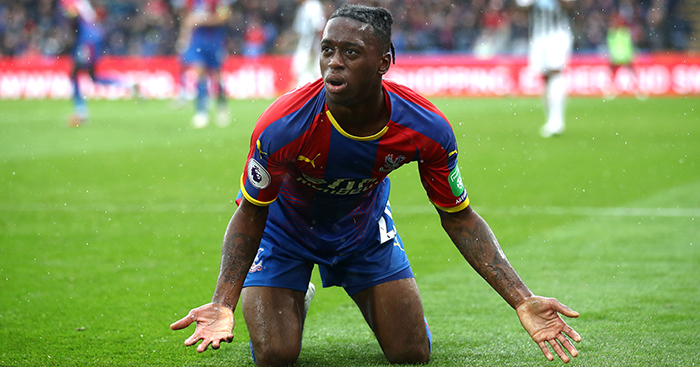 Wan-Bissaka’s current deal, signed back in April, ends in 2022, but a hefty bid from United would convince Palace to let go of their academy product. There is a reason why Pep Guardiola has been looking at him since November. Wan-Bissaka has a football brain which belies his age and, unlike Valencia or Young, he can manipulate the ball in a high-intensity environment out wide, when the angles are tight and a snapping challenge is near. He is very much the new age right-back: just as technically sound with the ball as he is from a defensive point of view, with an impressive burst of pace. United would certainly face competition to prize him away from Selhurst Park should they go in for him over the summer.